Shuckle in game: 5,189 Who? Important notice! Pokemon Shuckle is a fictional character of humans. Shuckle (Japanese: ツボツボ Tsubotsubo) is a dual-type Bug/Rock Pokémon introduced in Generation II. Shuckle is a Pokémon that resembles a small turtle. Its body is yellow and appears soft. Until they are in use, Shuckle's limbs appear limp. It is encased in a very hard red shell that has many holes in it. The holes in its shell are rimmed with white. Rather than actively hunting and foraging for food like most other Pokémon, it collects Berries and stores them in its shell. The Berries inside are liquefied and fermented while they decompose by Shuckle's digestive juices, which it then consumes. 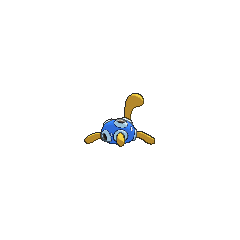 Its digestive juices are also used to dissolve rocks so Shuckle can hide under them. It can be found in the mountains. In A Better Pill to Swallow, an old man was using the Berry Juice that Shuckle makes to prepare medicine. One of the Shuckle that he befriended was a purple Shuckle whose Berry Juice attracted Pokémon to anyone who drank it. Because of this, Team Rocket made it their mission to steal it. Butch's Shuckle debuted in Sleight of Sand!. A Shuckle appeared in Double-Time Battle Training! under the ownership of Rebecca. It battled Zoey's Glameow in the finals of the Brussel Contest and lost. Conway used a Shuckle in his battle against Ash in Working on a Right Move!. A Shuckle was one of the residents of Big Town in Pikachu & Pichu. A Shuckle appeared on a poster in Imitation Confrontation. A picture of a Shuckle appeared in Hocus Pokémon. A Shuckle appeared in the opening of Lucario and the Mystery of Mew. A Shuckle also appeared in To Thine Own Pokémon Be True!. A Coordinator's Shuckle appeared in Dressed for Jess Success! participating in the Battle Stage of the Lilypad Contest. A Shuckle made a brief cameo in SS024, outside Professor Rowan's lab. A Shuckle appeared in Meeting at Terminus Cave! inside the Terminus Cave. EP170 Shuckle Ash's Pokédex Shuckle, the Mold Pokémon. When Shuckle places organic materials in its husk-like shell, the items are transformed into a unique juice. Shuckle are naturally shy and are most often found hiding beneath rocks. DP185 Shuckle Dawn's Pokédex Shuckle, the Mold Pokémon. Shuckle stores Berries inside its shell, and the Berries eventually turn into a delicious juice. Shuckle first appeared with Kurt. Kurt's Shuckle helps the Poké Ball craftsman make his special Poké Balls in Teddiursa's Picnic. A Shuckle was seen as one of the Pokémon Crystal captured and sent to Professor Oak via the Portable Transfer System in Off Course with Corsola. Later in The Last Battle XIII a Shuckle was one of the Pokémon sent to help the fight in Ilex Forest. Shuckle's most major appearance is in Volume 23, under the control of Orm, in his battles against Professor Oak (which he won with ease) and Oak's grandson Blue (which he lost eventually). Another Shuckle was seen under Pike Queen Lucy's command, where it showed off its fair deftness by badly poisoning Emerald's Starmie (as well as taking a number of attacks) before being washed out by a Surf. She hasn't used it since. Lucy was seen with a Shuckle where she used it to battle Enta's Vulpix. A Shuckle appeared in GDZ61. 51%-100% HP If the going gets too rough, I'll retreat within my shell! 26%-50% HP No more tomfoolery! My health is halfway down. Level up Yes, finally leveled up! I'll beat on my shell like a tom-tom! 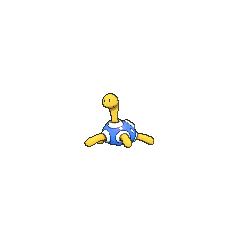 For other sprites and images, please see Shuckle images on the Bulbagarden Archives. Shuckle has the lowest base HP stat of all Rock-type Pokémon. Shuckle has the lowest base Attack stat of all Bug-type Pokémon. Shuckle is tied with Mega Aggron and Mega Steelix for the highest base Defense stat of all Pokémon. Shuckle is tied with Feebas, Bonsly, and Alolan Sandshrew for the lowest base Special Attack stat of all Pokémon. Shuckle has the highest base Special Defense stat of all Pokémon. Shuckle is tied with Munchlax and Pyukumuku for the lowest base Speed stat of all Pokémon. By using Power Trick, Shuckle can temporarily reach a base Attack stat of 230, which would be the highest of all Pokémon. Despite being weak to Water-type moves and being unable to use the move Surf, it appears in the sea in Pal Park. In Generation II, after holding a Berry for long enough, a Shuckle can turn it into a Berry Juice. Then, after holding a Berry Juice for long enough, a Shuckle can turn it into a Rare Candy. 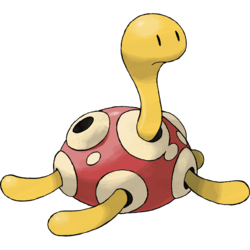 Shuckle seems to be based on an endolith, an organism that lives inside porous rocks or animal shells or possibly an abalone. It may also be based on scale insects—small, shelled parasites that produce a sweet fluid called honeydew that attracts other insects. 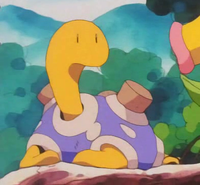 Shuckle may also have been based on certain varieties of mollusk, as it shares some characteristics with them, including the shell, the muscular but limp-seeming feet, the use of acids to receive food or to break down obstacles, the liking for fermented foods, and living close to the water. It may also be based on turtles or tortoises and vases, appearance-wise. 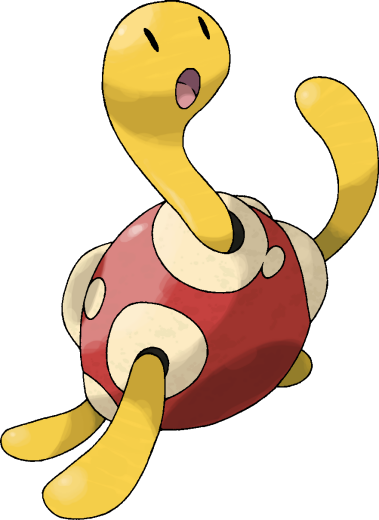 Shuckle may be a combination of shuck (a husk or pod) and barnacle or turtle. Tsubotsubo may derive from 壷 tsubo (jar) and 富士壺 fujitsubo (barnacle).